Marquis de Montesquiou Extra Old Armagnac — Emporia Brands Ltd.
Armagnac is the oldest French brandy. Already in 1310, the prior of Eauze, Cardinal Vital Dufour, extolled this "burning water", born from the distillation of wines from Gascony soils. The Montesquiou family has been firmly rooted in the soil of Gascony since 1040. It counts among its members the famous Gascony musketeer d'Artagnan, musketeer of the King of France. The bottle gourd-shaped, symbolic of the Montesquiou range, directly refers to this legacy. It is in Eauze, ancient medieval village, which are assembled since decades the subtle distillates Montesquiou House, from the most prestigious vineyards of Armagnac. Marquis de Montesquiou Armagnac is made by using ancient mobile stills that used to travel from farm to farm, respecting the ancestral method. The wine is essentially distilled in Autumn while it is still fresh and full of powerful aromas. 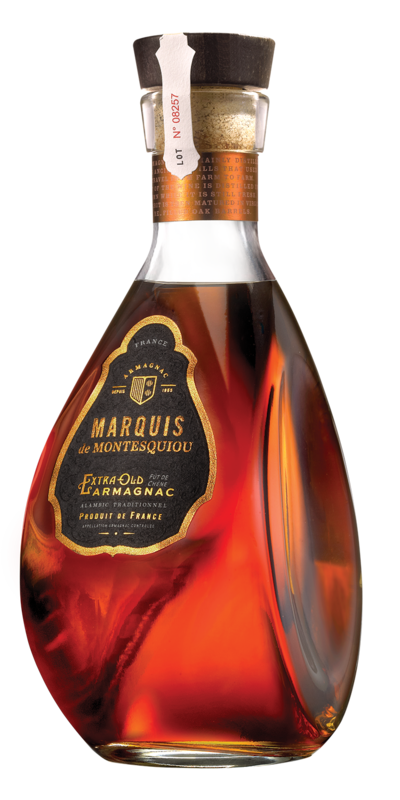 Marquis de Montesquiou Extra Old Armagnac is a powerful Armagnac composed of extensively mature eaux-de-vie. The selection of eaux-de-vie creates an excellent harmony with the compounds of the wood that was extracted over more than 10 years ago. It contains mostly Bas Armagnac which brings vigour, freshness and a strong aptitude to be blended. At La Maison Montesquiou, the ageing cellar is called the Cathedral, as its dimensions and the silence prevailing there command respect. Nose: A highly expressive nose with a slight spicy note. Palate: A round and spicy sensation, sichuan pepper in the finish.